Here the final two covers from Ernst Toch’s private LP collection, maintained at the Library of Performing Arts at UCLA. For those who missed Misha Horenstein’s comments on the previous posts and are curious as to who, exactly Corinne Chochem was, I include the biography as offered by Pauline Koner in the Encyclopaedia of Jewish Women: “Best remembered for her contribution to Jewish cultural life and for her unique ability to inspire those around her, Corinne Chochem had a distinct impact on Hebrew folk dance, both in her teaching and her two books, Palestine Dances (1941) and Jewish Holiday Dances (1948), the latter an original work for which Leonard Bernstein, Darius Milhaud, Ernst Toch, and Tedesco wrote music based on the original folk tunes. Studying in Israel in 1950, she met and married the painter Yehoshua Kovarsky, and began to study painting. Later in life, under the name of Kovarska, she found fulfillment as a painter with several exhibits in Los Angeles. She used both acrylics and ink. Her final black period was exhibited in New York in 1987. Corinne Chochem was born in Zwanitz, Russia, in 1905 to Esther (Gendelman) and Mendel Chochem. The family immigrated to the United States in 1920 and settled in Newark, New Jersey, where she taught Hebrew and dance at a Montessori school. 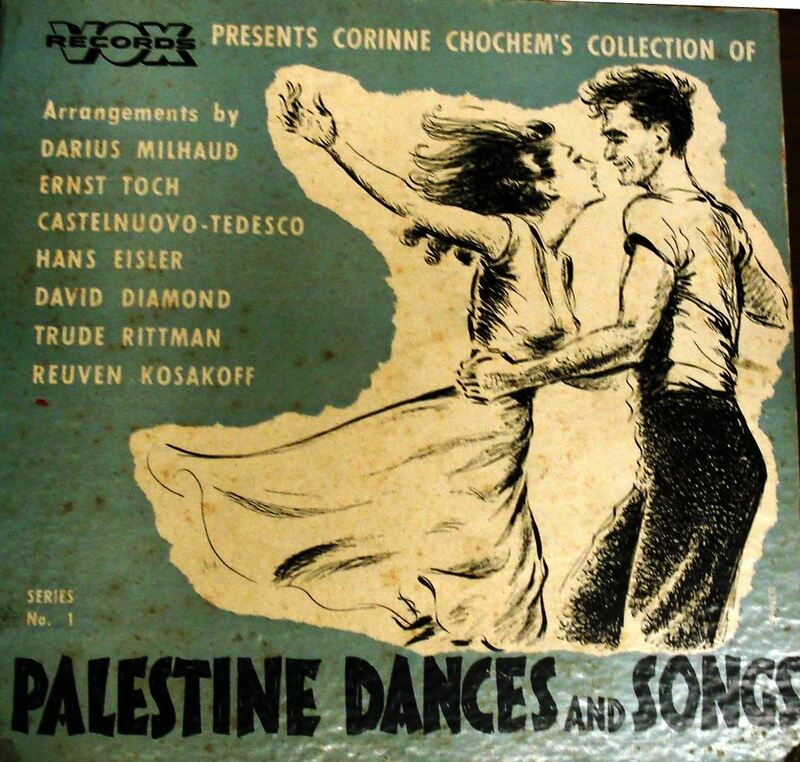 Vitally interested in dance, she went to Palestine in 1930, where she worked on a kibbutz while researching folk dance. After studying with Martha Graham, Louis Horst, and Carmelita Maracci, she found Pauline Koner and discovered a kindred spirit. Frail, but with tremendous energy, Chochem founded the Rikud Ami dance group, taught at the Jewish Theological Seminary, the University of California, and as guest artist at the Hillel Foundation at Cornell University. Her sister, Fanya Sage, was also a dancer. She also had a brother, Ben Charles. Corinne Chochem and her husband settled in Los Angeles in 1953, where she concentrated on her special talent: dance for children. Kovarsky died in 1967, and Chochem began a career as a painter. She died in 1990.” Comments below the article add that her sister Fanya Sage was married to the Los Angeles sculptor and artist Max Finkelstein and that she ran a dance school that was based on Martha Graham’s technique. For me, these covers – as graphic designs – speak of the idea of Jewish confidence following both the fall of Hitler and the founding of Israel. They offer a door to belonging, where over years they have been excluded.